Freddie Mac sees strong apartment rental growth next five years in valuation report. 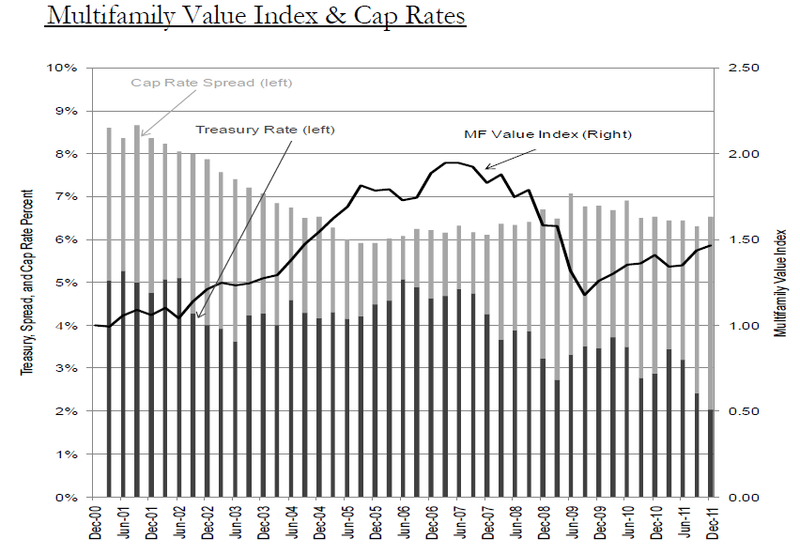 A very interesting report on apartment building investment posted on the Freddie Mac website discussing Current Multifamily Values & Cap Rates In Historical Context explores where the market is today and where it is likely to be in five years under a number of different interest rate scenarios. Freddie doesn’t do loans smaller than $5 million (implying a minimum deal size of $6.6-7 million) and many of their borrowers are large institutional investors but the forecasting methods and valuation models they use are applicable to apartment building investing on any scale. Rental growth rates are expected to be Continue reading Freddie Mac sees strong apartment rental growth next five years in valuation report. Posted on May 23, 2012 June 22, 2012 Categories Apartment Building Investment Cycle, Apartment Finance, Multifamily InvestmentsTags Apartment Building Investing, apartment building investment cycle, apartment finance, Cap Rates, ecomomic outlook, interest rates, multi family lending, multifamily loans, valuation, values3 Comments on Freddie Mac sees strong apartment rental growth next five years in valuation report. The Yin/Yang of Apartment Building finance: Urban Equity v. Suburban Debt. [Urban] TOD (Transit Oriented Development) has performed better and has a sexier image with many institutional investors. But while equity investors continue to favor urban TOD, developers are having a more difficult time finding construction debt at leverage levels that would make those deals pencil out. “We’re in an interesting situation now, where anytime you have a Continue reading The Yin/Yang of Apartment Building finance: Urban Equity v. Suburban Debt. Posted on April 13, 2012 April 17, 2012 Categories Apartment Finance, Multifamily Design & Development, Multifamily InvestmentsTags Apartment Building Investing, apartment demand, apartment finance, multi family equity, multi family investments, multifamily development, Suburban apartments, TOD, Transit Oriented Development, Urban apartmentsLeave a comment on The Yin/Yang of Apartment Building finance: Urban Equity v. Suburban Debt.